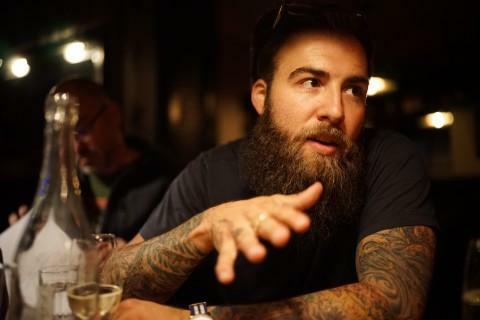 Ross Maloof got his start in winemaking through the Philadelphia restaurant scene, while he was working at such wine destinations as Vedge and A. Kitchen. In the midst of managing a booming, natural-focused wine program he connected with Brianne Day and soon found himself working harvest at Day Camp (A co-op started by Brianne). He returned the following year with his fiancée, Brittany Selman, and stayed even longer this time. They came back to Philly, but Oregon had left its mark on them, and they wouldn't be staying away long. In 2017 they will be relocating to Oregon permanently. During these two harvests, Ross was able to make a little wine of his own, and such is the start of R. Maloof wines. The first release is a Syrah & Viognier blend reminiscent of Day's Hock & Deuce, yet is a distinctive expression all its own. It was made under Brianne's careful guidance and, in fact, is emblazoned with her likeness, but shows an exciting glimpse of Maloof's abilities and vision.